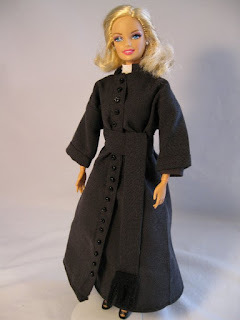 "You know, when people ask me about women in priesthood, they say, "Sister, why can't women be priests?' And I say, 'Women can be priests. We don't want them to be priests." Because you see, God can do anything, and the Church, by divine authority, uh, can do anything, but, the Church doesn't want to -- and that's a legitimate reason. What I don't like is when we try to pretend that there are other reasons for this, because it's legitimate not to want something, and there are reasons not to want this - right? - but, we shouldn't pretend that there's some... reason, that, for example, the maleness of Christ is essential to priesthood. Because, the question in this whole big question, is, when we discuss something like the fact that Christ is indeed male, we can ask, with regard to priesthood... we should ask, this is the question for the whole argument -- is Christ's maleness essential to priesthood, or is it accidental? According to Aristotelian logic this would be at the heart of the question, okay? Is it essential, or is accidental? So, is it something... a sine qua non to Christian priesthood?" The fact that Christ was a male, may or may not have anything to do with why we have a male only priesthood. It could very well be, at least in part, that the priest serves as an icon of Christ liturgically, and that this is part of the reason. However, it is also true that women can function as icons of Christ too. But whether or not this is a reason, there clearly are reasons for this practice, whether we individually understand them or not. If there really was no reason for this practice, what sense would it make? It wouldn't. And the idea that this practice was due to the limitations of the times, and that perhaps it just never occurred to anyone that women could be ordained as priests is a ridiculous argument... because the Israelites and later on the Christians were surrounded by pagans that had priestesses. And yet in both the Old and the New Testaments, the liturgical priesthood was exclusively male, despite the practice of all those around them. Being a priest is a fatherly role... which is why priests are called "Father". There are also motherly roles in the Church, and women fulfill them. Then there are roles that are open to "whosoever will," and women fulfill those roles too. And we as families and as a Church need to encourage men to fulfill those roles which are in fact fatherly. Women tend to be more pious than men, speaking generally. Often at lesser attended weekday services, I am reminded of the women at the Cross of Christ, because when I look out at the congregation, I might see the occasional "John", but the women almost always outnumber the men by rather large margins. Men need to be encouraged, especially by the women in their lives, to take up their responsibilities as spiritual leaders in the home and in the parish, otherwise, you generally won't see men functioning in positive ways in the Church, in any great numbers. Of course many in our politically correct culture will immediately react to any suggestion that there is a need for male spiritual leadership, but there is empirical data that demonstrates that this is simply a fact of human nature, as God created it. There was a Swiss study that showed that if both the father and mother attend Church regularly, 33 percent of their children will be regular churchgoers, and 41 percent will attend irregularly, and 25 percent of their children will cease practicing their faith altogether. If the father attends Church irregularly but the mother is regular, only 3 percent of the children will attend Church regularly, 59 percent will attend irregularly, and 38 percent will cease practicing their faith. If the father is non-practicing and mother attends Church regularly, only 2 percent of children will attend Church regularly, 37 percent will attend irregularly, and over 60 percent of will cease practicing their faith. However, if the father attend Church regularly but the mother attends irregularly or is non-practicing, the percentage of children who grow up to be attend Church regularly goes up from 33 percent to 38 percent with the irregular mother, and to 44 percent with the non-practicing mother. Clearly this shows that the spiritual leadership of the father, or the lack thereof, plays a crucial role... and that is just the way it is, whether one likes it or not (See: Touchstone Magazine: The Truth About Men & Church, by Robbie Low, you can also listen to a sermon on this topic: Christian Leadership in the Home). Furthermore, if ever there was a human being (aside from Christ Himself) that was more worthy of any honor the Church could bestow, it would be the Virgin Mary, and yet she was never ordained to serve a priestly role in the services of the Church. However, while she did not preside over the celebration of the Mystery of the Eucharist -- she played a rather crucial part in the Mystery of the Incarnation of Christ, which made the Eucharist possible. Motherhood (both natural and spiritual) is a great honor and a thing of incredible power, beauty, and worth. Fatherhood (both natural and spiritual) is not a better thing, it is simply different. As most of us have noticed, men and women are different, and our roles are different, but they are complementary. Neither is possible without the other, and both depend on the strength and support of the other. And so we should not allow ourselves to be talked into blurring the lines between the two by a culture that is on a self destructive trajectory, and which has only managed to rob both men and women of the virtues of their sexes. "And if you pay attention to the argumentation in Hebrews, where the author of Hebrews is at pains to show that there is the possibility of change to the way priesthood is, um... is... how do you say... served, right? Those who have ...see, the author of Hebrews is at pains to explain to Jews how in the world those who are not of the tribe of Aaron and so on, those who are not Levites, why in the New Testament now other can be priests. And he is explaining that... uh... the priesthood according to the rite of Melchizedek. So, he's explaining a new kind of priesthood, and he is explaining that this is something that is changeable, as to who can be a priest, okay? So if one explores the Epistle to the Hebrews, one can see that there are... that the question of who can be a priest is something that is indeed a changeable aspect of tradition. What is not changeable is the basis for all priesthood, and that is of course Our Lord Jesus Christ. That's where the question arises: who... you know... what... what aspect of his person is essential to that service that is priesthood, that ministry, that, that mystery, um... is it, does it include his maleness, for example, would it include, if Christ indeed had black hair, for example, would priesthood be limited to those with dark hair? You know, I mean, we would ask what is essential to the person of Jesus Christ in his priesthood? Would his maleness be part of that? Anyway, traditionally, actually, we don't see the maleness of Christ thematized at all... it's not a patristic... nowadays some people who are at pains to argue against females in priesthood... whereas I don't think there's a big problem, we should just say honestly, "We don't want women to be priests. As Church, we don't want that." That's fine, you know, that's fine, but we shouldn't say that we couldn't have women as priests." Actually, the Epistle to the Hebrews does not in the least suggest that who can be a priest is changeable, in the sense that it might just change again at any moment. St. Paul says that with the New Covenant there is a new ministry, i.e., the worship of the Old Testament is changed with the New (Hebrews 8). Unless Sister Vassa is expecting the establishment of a New and Improved Covenant before the second coming, there is no reason to expect any change in the priesthood... and as a matter of fact, the exclusively male character of the liturgical priesthood is one aspect that has remained constant in both the Old and New Testaments. Obviously, Sister Vassa wants to have plausible deniability here, and to be able to say that she is not advocating for women to be ordained as priests, but that is in fact what she is doing. If you insist that there is no reason why women cannot be ordained as priests, and that the Church just "doesn't want to," at this point, but that this is a matter entirely up in the air, the logical conclusion is very clear. The key lyric: "Don't listen to St. Paul..."
Stump the Priest: Altar Girls?